What Strings Do Everyone Use? One of these days, I think I will keep a small army of basses, all strung and tuned differently. "haha you cant have me"
I don't think I will ever have that many different tuning combinations! And yes, the Buy It Now urge was willing, but the wallet was weak. Lucky for me those great Yamahas, be them the newer models or the the older used versions, are readily available. Figure I'II post as well as long as its bumped. I use D'Addario Pro Steels. I used to use Rotosounds but I find that the Prosteels sound better for longer when they are worn in. When I used Rotosounds it felt like I was going from new to dead sounding strings too fast. I don`t have a favorite string set yet, but I can tell you what I will not be using. Got some Ernie Ball Stainless Steel strings for one of my main basses, liked them ok for awhile. Once they were`t new anymore I didn`t like them much at all. 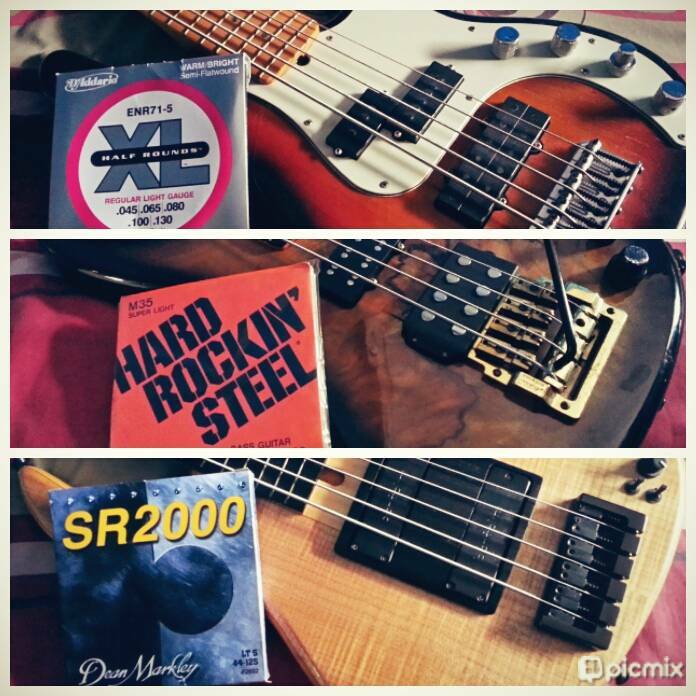 I`m still using them until I get other strings, but these will not be going back on my basses. Sheesh! This WAS an old-thread bump of epic proportions! The last entry before the bump was almost four years ago! Have I really had this board up for that long??? I'm still partial to Roto's. For the longest time I exclusively used Rotosound Swing Bass and Funk Masters. I had a brief excursion into Dean Markley Blue Steels (I was part of the test group in the early 90's). But for the last 4 yrs I've been using S.I.T Strings. I had Tweeted about using their Power Steels on my 12 string bass and the desire for a super light gauge. Tim Pfouts (pres of S.I.T.) contacted me about putting together a custom set. His team did just that and I was blown away by both their product and customer service. Since then my band has gotten an endorsement deal with S.I.T. and I have been using their Rock Bright Stainless Steels on all my basses. Tim and his team have provided invaluable help whenever I have questions regarding the best strings for any one of my basses. I recently contacted Tim concerning a custom set for my Ibanez SR506 which I want to tune EADGCF in a super light gauge starting at a wrapped .020 F down to a .090 E. His team immediately got to it. Stay In Tune String do exactly just that..stay in tune. And they do it well. My Rock Bright Stainless Steels are bright, punchy, have singing harmonics and an aggressive growl. I have 5 Jazz Basses and that wonderful 1970's bark and bite that I love is handled without exception by my SITs. They have a defined tone and impressive sustain. On my fretless Jazz they have just the right amount of distinction in the mwah factor and really sustain when articulated. They feel great on the fingers. I am still awaiting my SoundGear's return with it's new Kahler Trem. I will post a review as to both the Kahler and the strings' performance. Stay tuned! We've had similar experiences, Juan! I have also used Blue Steels, as well as SIT strings. My one and only complaint (and again, this goes back to mo own personal experience) is that neither had the brightness longevity of Roto's. Both seemed to lose top end much sooner. Now, it has been a while since I used either one, so maybe I need to revisit them again, especially the SIT's. Subject: Re: What Strings Do Everyone Use?